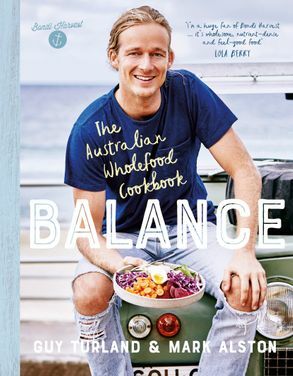 Find the right balance in your life: over 150 delicious wholefood recipes for maximum health, wellness, energy and vitality, from YouTube cooking sensation, Guy Turland - as seen on Tastemade. One for fans of Jessica Sepel, Lola Berry, Sarah Wilson and Pete Evans. If Jamie Oliver was fifteen years younger and had grown up in Australia, surfing, diving and cooking by the beach, you'd have Guy Turland from Bondi Harvest. Guy is a chef, surfer, health fanatic, free-diver, an Australian YouTube cooking sensation, as seen on Tastemade. He runs the Depot café in Bondi Beach and the Bondi Harvest cafe on Santa Monica Beach (yes, Gwyneth Paltrow is a fan) and his new Bondi Harvest cookbook, Balance, is all about eating for energy, vitality, wellness and wellbeing, with over 150 simple and simply delicious recipes. This is wholefood food that's not only good for you, but is delicious, seasonal, vibrant, and full of zingily fresh flavours, designed to be eaten and enjoyed by friends and family. Guy Turland is a chef who has trained at some of Sydney's best restaurants (Est and Bondi Icebergs) and now runs his own café, the Depot at North Bondi, plus the Bondi Harvest café in Santa Monica. Mark Alston, his business partner, is a filmmaker with a background in photography, design and making music videos. Together, they are Bondi Harvest - and they're all about healthy food and cooking, sunshine and good times. Bondi Harvest has over 74K subscribers to their YouTube cooking channel, 22.5K followers on Facebook,2.2K Twitter followers, and 46.4K Instagram followers.